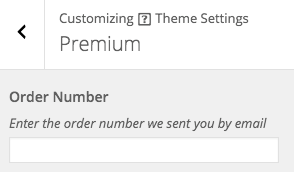 AppearanceCustomizeTheme SettingsPremium is where your order number will be inserted to allow for premium theme updates. If you’ve already inserted your order number via AppearancePuro Premium then there is no need to insert it here, it’ll automatically be inserted during the upgrade process. If however you’ve upgraded manually using the Puro Premium ZIP file then you will need to manually insert your order number in this field to ensure you receive premium theme updates as they are released.